In mid November the North Korean state media carried stories about the inauguration of a new distance-learning network. The reports expand on a brief bulletin issued in early October about the start of an “online lecture” service. The network is based at the Grand People’s Study House in Pyongyang and connects to centers of learning throughout the country, including local people’s study houses, libraries, scientific centers and educational institutions, according to the reports. People’s study houses in different provinces including Jagang and North Hwanghae provinces and libraries in cities and counties have already made full arrangements for receiving distance lectures from the Grand People’s Study House by use of high-speed information system provided by optical fiber communication. This has paved the way for putting the people’s educational system on the latest science and technology. The DPRK began installing a nationwide fiber optic telecommunications network in 1998 with funding support from the UN Development Program. Thanks to the establishment of the new distance lecture system which puts main emphasis on the lectures based on real-time dialogue while providing the subscribers with opportunities to review what had been lectured anytime necessary, working people and students across the country can receive distance lectures in diverse ways according to their study plans. It’s not the first time media has reported such a system in North Korea. 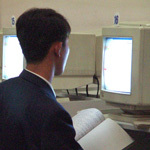 Kim Chaek University of Technology started a similar system in January 2007, according to a KCNA report from the time. 1 Comment on "Distance education network reportedly launched"
This sounds as if it might be based on the learnwithelsi e-learning system developed last year by an Italian company and a British/North Korean joint venture.